Our range of products include chip resistors. We are the Leading traders of Chip Resistors. 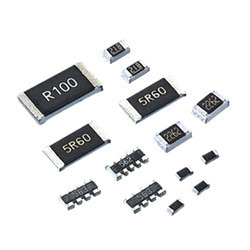 These chip resistors are stable at high temperature and humidity, have tight resistance tolerance and Temperature Coefficient of Resistance, low current noise, and excellent linearity. Resistors act to reduce current flow, and, at the same time, act to lower voltage levels within circuits. In electronic circuits, resistors are used to limit current flow, to adjust signal levels, bias active elements, and terminate transmission lines among other uses.